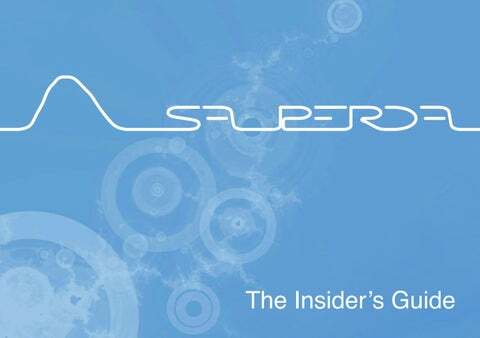 The Insiderâ&#x20AC;&#x2122;s Guide Get the most out of your holiday Welcome to Sa Perda holiday homes. Sa Perda is a family owned and managed residence, established with the aim of assuring visitors the comfort and intimate atmosphere of a home away from home. Here youâ&#x20AC;&#x2122;ll find some tips we wrote for you in order to quickly take advantage of the most enjoyable activities Ogliastra can offer. Beaches Here are our favorites. Please share your own with us! On a lazy day: weâ&#x20AC;&#x2122;d recommend San Gemiliano beach. It will never be too crowded and itâ&#x20AC;&#x2122;s just at the end of the street! ;-) Porto Frailis bay nearby is pretty and has shallow waters for young children. * you could also stroll to the Saracena Tower to enjoy a breathtaking view on the gulf. Shallow waters: if you just want to relax with young children you could go to Cea Beach (20mins) or Lido di Orri (10mins). The latter is divided in many tiny beaches amongst which we definitely recommend Foxi Lione and Il Golfetto. Expert swimmers: enjoy the wide and long beach of Torre di Bari. The tower was used till the 1950s to separate the two beaches from men and women! Looking fore some adventure: travel to the different bays in the northern coast of Ogliastra. They will surprise you for their crystal clear waters, white sand beaches and impressive cliffs. Cala Goloritze, Cala Mariolu, Cala Luna are just a must whilst visiting our coast! History Sardinia is an ancient territory. If you want to discover our Nuragic roots here are the most beautiful archeological sites of the area. Beware of the fascinating legends that animate these places. Spooky access to the underworld populated by supernatural creatures getting out of their lurk only at night, the so called “Janas”. S’Ortali e Su Monti At about 10mins by car from Sa Perda holiday homes, this archeological site is the closest to our property. There are some beautiful panoramic views from around the tower, which you can access with a guide. You’ll also find domus de janas (house of fairies) and the large stone menhir. Nuraghe Su Serbissi The most beautiful nuragic area in the Tacchi d’Ogliastra, located 964-asl. It presents three circular towers and a small village of huts and a cave. The place is so remote and quite you can hear the birds flapping their wings. Seleni Green Park The archeological nuragic complex of Seleni has Giants tombs of the 15th-13th centuries B.C. and a nuragic village overlooking the entire valley. Especially loved by locals, who enjoy calming walks in the woods or gathering under the trees, around massive granite tables for cheerful picnincs that last up to 12 hours. History Nuraghe Scerì In the countryside of Ilbono, the nuraghe complex is composed of circular towers for home use and manufacturing, dating back to the Bronze Age. It also includes some domus de janas in single-celled plant, with funerary purposes, located at the base of the tower and dominated by granite dolmen. S’Arcu ‘es Forros in Villagrande Strisaili, dating back to the Iron Age, comprises three megaron temples dedicated to the worship of water, a village consisting of a block of 12 rooms overlooking a circular courtyard, a dolmen with just one tower and a giant tomb. Inlands + Hiking Il Golgo (su Sterru) Europeâ&#x20AC;&#x2122;s deepest single-span chasm. 270mt filled with mysteries and ancient legends. It can be reached on foot by crossing a fascinating landscape (on the high planes of Baunei): lava flow on limestone, ferns and holm oaks covered in moss and small ponds (piscinas). There are quite wild animal (big fun for the kids), a fascinating 17th century church of San Pietro and a good restaurant with delicious local dishes. Perda Longa can be reached by car or by boat. Have fun diving from the cliffs into crystal clear waters, or simply enjoy an ice cream from the most scenic terrace on the sea. Your bones ache or youâ&#x20AC;&#x2122;re too lazy? Get on the Green Train for an unforgettable 1-day experience in one of the most ancient railways in Europe. Experience the surprising wilderness at a very slow rhythm, enjoy strolling about in a beautiful green park, and good local food at the end of your journey. Where to eat? I bet you are hungry!... Ristorante Da Lenin €€ At a walkable distance, has delicious fish and meat dishes. Local and traditional flavours in a casual athmosphere. Acquolina €€ Enjoy your dinner/ pizza on the beautiful terrace looking at the bay of Porto Frailis. Friendly staff at a walkable distance. La Bitta €€€ Do you want to pamper yourself and your beloved ones? The price is worth the experience just in front of the bay of Porto Frailis. Lucitta €€€ If you want to get fancy and eat good fish. Don’t worry if you’ll drink a little extra wine, you’ll be just 5 mins from home! La Capannina €€ Casual but still a romantic atmosphere. You’ll be right in front of ‘Capannina Beach’ Arbatax, and can enjoy tasty local fish dishes. Where to eat? I bet you are hungry!... La Peschiera (Ittiturismo) €€ Charming environment, casual atmosphere and generous size dishes. This is a local fish farm where you can enjoy a nice walk. Children and comfy shoes friendly ;-) Sa Buttega €€ On the popular Via Monsignor Virgilio in Tortoli it’s perfect for a stroll in town. Make sure you book a table well in advance. We love their pizza and fish menu! La Favorita Located in the popular Via M. Virgilio in Tortoli, it is my favorite place for ice-cream. It is hand made and gluten free! *no matter where you decide to go, just try our most delicious and typical dessert. It’s called “Seada” or “Sebada” according to the dialect of each town. You’ll be delighted! *Are you more svoury taste? Try our very local “culurgiones” only in Ogliastra you will find the authentic receipe with the IGP label of quality and originality. Let’s save some money! How about a BBQ or a nice breakfast in the relaxed athmosphere of our holiday homes? Here’s where I’d go for groceries! Simply - close to home, good quality products especially fresh fish (open on Sunday) Conad - quite a big supermarket with a wide choice of products (open on Sunday) Europlanet - you can find good deals here for napkins, shampoo or sunscreen. But there’s no food! Eurospin - if you really want to save some money on food and other products. Cooperativa Pescatori di Tortoli - Wide selection of the fish of the day. Did you see that truck? You will find lots of trucks along the road, selling fruits and veggies. They are farmers who sell their products at a very reasonable price. Delicious, fun and convenient! Tell us how we did How would you rate your experience at Sa Perda Holiday Homes? We value your feedback! Your comments will help us to further improve your next experience. 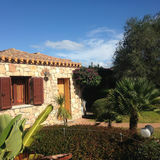 Your comments will help others to know what to expect when looking for a holiday home in Sardinia.